Another thing THH doesn't hate, but he hates the carafes. Well he does like the stove top one. 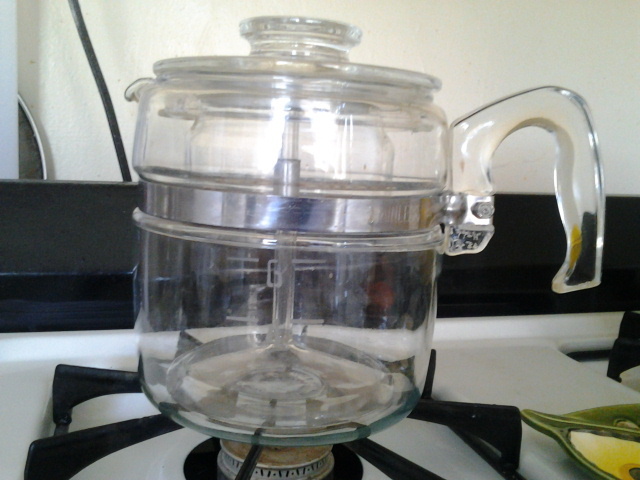 A month ago or so I ran across the outside parts of a 9 cup Pyrex Coffee percolator. I wished it had the insides. I knew I would never just find the insides so sadly I left it there. 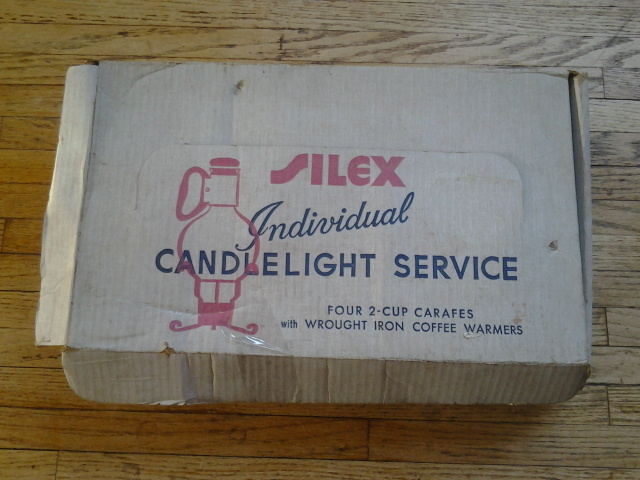 I then thought to myself and did look on ebay for one. Holy crap do you know how much those things go for? Average price about $35 plus shipping. Now I am NOT paying that much. I went to a thrift store down the road. AIDS thrift Shop, they support the Gay and Lesbian community here in LBC and run a medium size shop at cheap prices. 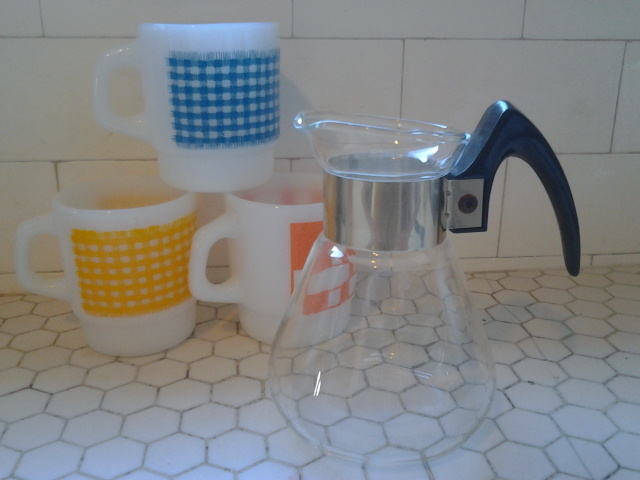 I found this small Carafe for $2. No lid, nothing, but I love it for say... chocolate syrup. Anchor Hocking/Fire-King (both names are on the bottom) mugs I picked up for 50 cents a piece. Then on Friday 3/30 I did my afternoon trip to Salvation Army. I like to shop on way home if I have a free minute or two. And knowing I couldn't go the next day as I was going out of town to go bowling with my brother I really wanted to stop. Glad I did. As I was walking through the housewares I spotted this. I ran to it. Complete, the handle, the insides. THE LID! turn it around to look for a price. No crap $5.99. I about died right then and there. I had to call THB. To say the least she is the most happiest because he hates we don't have a coffee pot. Now I do. I spent a good 15 minutes on the phone, telling here what I was seeing and trying a few handheld mix masters out for her. Then I spotted this. All the piece's there. This thing is cool. Who wouldn't want their own little coffee pot at a small dinner party. Needless to say the $6.00 price tag was a good sight and it happily came home with me. 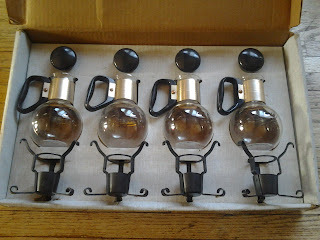 Who wants to have a small dinner party to use the cool little carafes with me? But I am still overly in love with the Pyrex percolator. Even THH was happy about this one. And to top it off, they were 30% off making the Percolator $4.20 and the Set $4.90. Do a little happy dance with me.